Sharing another customer review. This time from an almost stock BMW 335XI running an E50 octane blend (50% ethanol 50% 93 octane gas). The only modification to the car is an AFE Dual Cone Intake and our custom tuning. Thank you @vwgrk for giving us the opportunity. I recently went to a dyno to see what my PTF E50 / 93 octane map is putting to the ground on my manual transmission 335xi. The only other modification is an AFE DCI. The plugs are new and I was walnut shelled a few months ago. The results are 413 whp & 448 wtq. 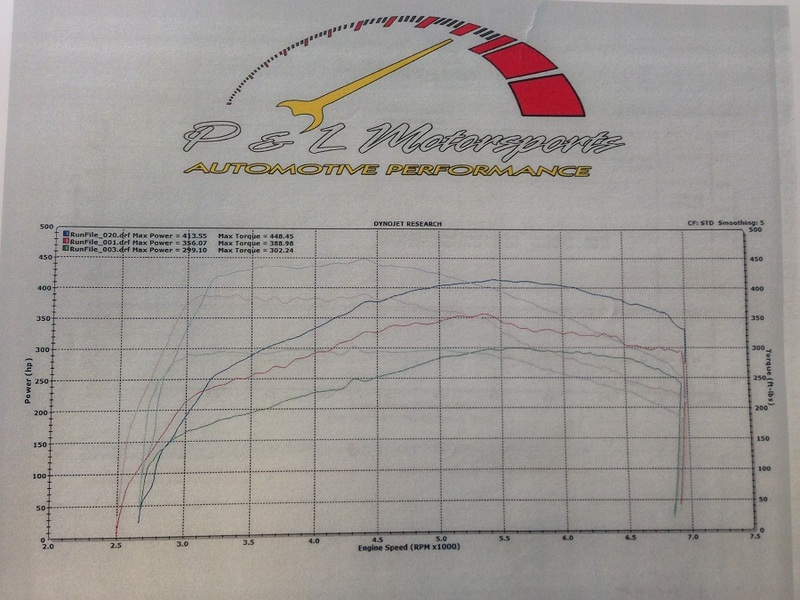 This is massively impressive to me given the relatively huge delta over both stock (from what I gather, 280 whp/wtq on P&L Motorsports’ AWD dyno in Franklin Park, IL) and the 93 aggressive OTS Cobb map (356 whp & 389 wtq). As the below graph shows, a peak number comparison is just part of the story. The delta in the meat of the power curve is quite good. Tuning with PTF was a good experience. I would encourage those on the fence to pull the trigger because it is of great value, especially for those on ethanol blends like me. PTF is very responsive and was willing to make small customizations to suit my preferences in throttle feel and high-end timing. He took the time to answer all of my questions, which was valuable to an inquisitive person like me. Doing runs in 3rd gear and emailing them to PTF is pretty easy and you can take your time doing it. I started in September and didn’t finish until December (holidays, business travel, having to get a DCI and getting married interfered with my tuning schedule). This flexibility was a huge plus. The map is smooth in all situations and drives predictably. From the graph, one can easily see why people say not to take 3rd gear and higher up to redline- the power falls off fast. Also, PTF was able to get rid of the 3rd to 4th gear shift knock / timing pulling. In fact, this was the reason I first reached out to PTF. Before I am asked, the dyno operator, sadly, did not log the runs properly, so I do not have the logs of these runs. So, do I earn my FlexFuel badge yet? Front-door parking for me at Whole Foods from now on! Blue is the PTF map and red is the Cobb Stg 1 aggressive map. Green was a failed attempt to show what a stock map with a DCI would do (not like I could drain the fuel tank, so it had to be a custom map). Boost was a pound or so too high and I didn’t feel like monkeying around with it since the curve looked within expectations. Each run posted is the best of three with similar cool down times in between. IATs were similar between runs and higher than I’d like. Intercooler upgrades are key on this platform.